adidas has scouted a young team of emerging 'Engine' players from throughout the world and hosted them in a once in a lifetime, ground-breaking event in Brazil, the home of football and the 2014 FIFA World Cup. Promoting adidas' recently launched nitrocharge™ boot, 'Power Pitch' is the first event of its kind - where the players' actions on the pitch translate into powering the lighting around the arena. Each pass, sprint and tackle had an impact on the lighting to show the raw, relentless energy of each player – thus resulting in a mesmerising film showcasing the power and energy of 'The Engine' players in action. Each player from throughout the World was identified as the type of footballer the nitrocharge™ boots are especially designed for, box-to-box players with relentless energy in the mould of Daniele De Rossi, Ezequiel Lavezzi, Javi Martinez &amp; Dani Alves. Surprise scouting sessions took place with some of the world's top football stars including Daniele De Rossi, Patrick Vieira &amp; Jamie Carragher surprising young amateur players from their respective nations. Each 'Engine Scout' was briefed to look out for the qualities that best characterise 'The Engine' player and selected the winners based on key factors including work rate, pitch coverage and key attacking and defensive actions. The winners were invited to play central roles at the event in Brazil and included youngsters Jerome Martelli-Denton from the UK, Andrea Delianni of Italy, Cyprien Morin of France, Andres Ona Alcocer from Ecuador, Ruben Ramirez of Venezuela and Jae Hoon Lim from South Korea. A cutting-edge film has been produced from the content captured at the 'Power Pitch' event and showcases how the relentless qualities and characteristics of 'The Engine' player can be transformed into fast-paced, visual energy. State of the art filming techniques were used with customised rigs developed for GoPro cameras and camera drones capturing HD, multi-angle footage to bring the action to life. nitrocharge™ player Daniele De Rossi said: "Power Pitch is an exciting event that focuses on the idea around 'The Engine' player. I was lucky enough to be involved with selecting one of the players and it was an honour to be able to provide a great moment to a young, aspiring footballer. To give Andrea, the player I scouted, the chance to not only go to Brazil – the home of next year's World Cup – but also to take part in a really cool adidas football event was amazing." The visually striking nitrocharge™ boot is an evolution of adidas' heritage in creating footwear to fit certain player types. 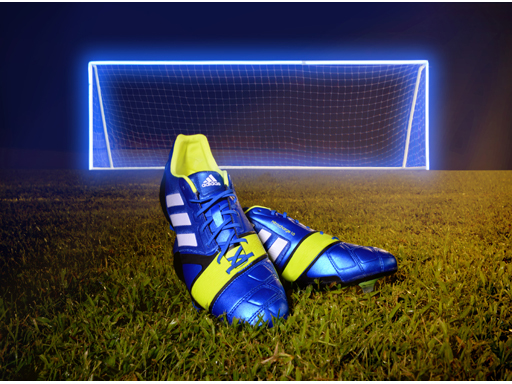 The unique positioning of nitrocharge™ has energy retention at its heart and has been designed specifically for 'The Engine' player, the archetypical footballer who is always first on the team sheet; the player who powers a team, running and tackling more, relentlessly and ferociously seeking chances from box-to-box over 90 minutes. 'The Engine' is a player adidas has recognised and actively sought to engage with over the last two years. Now, following a partnership with football statisticians Opta, an algorithm has been developed from which player performances can be analysed to determine how well they suit 'The Engine' role. To buy the new adidas nitrocharge™ boot please visit the official adidas online-shop www.adidas.com/nitrocharge-collection or to join the conversation visit facebook.com/adidasfootball or @adidasfootball #TheEngine on twitter.